Perhaps jelly that a teen who co-mobilized over a million people for gun control legislation has about twice as many Twitter followers than the NRA, the organization and its supporters have weaponized with Photoshop, conspiracies, and attack ads against Marjory Stoneman Douglas High School mass shooting survivors. Normally I’d prefer to avoid giving a platform to delirious ranting, but this is a democracy. Or the premise of March for Our Lives is to restore democracy by reducing the voice of the NRA which overpowers the voice of voters by raising money from its members through messaging and then donates that money to politicians; and maybe most importantly, by telling members how to vote. Whatever, they’re loud. 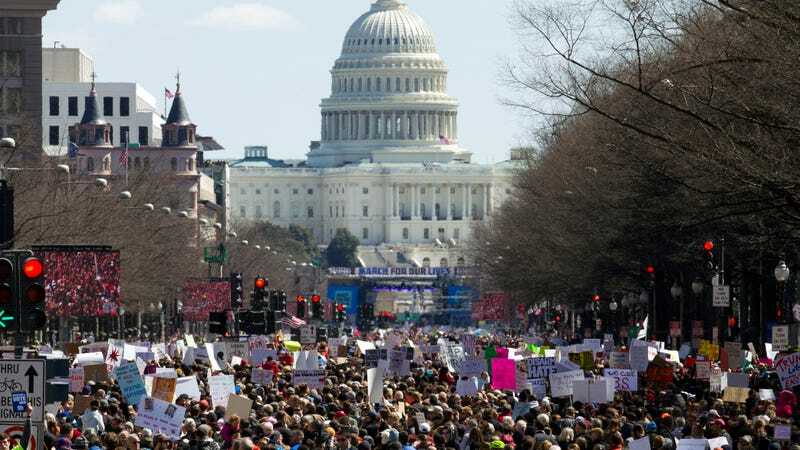 First, their contenders: the best of yesterday’s March for Our Lives speeches were messages of love and solidarity delivered by children whose arguments are based on factual evidence supported by statistics. These included an 11-year-old quoting Toni Morrison; Martin Luther King Jr’s 9-year-old granddaughter quoting Martin Luther King Jr; Chicago teens protesting the endemic and ignored gun violence in their communities; and a Marjory Stoneman Douglas High School student bringing up to 800,000 people to silence. Politifact checked the speeches and messages on the March for Our Lives site, and most statements were either correct or approximate. Conspiracy and hideous meme, check and check. Gun-hating billionaires and Hollywood elites are manipulating and exploiting children as part of their plan to DESTROY the Second Amendment and strip us of our right to defend ourselves and our loved ones. But the statement reenforces the teens’ whole point, which is that we shouldn’t know their names at all. I don’t want to see this ever happen again. And what I saw at the march yesterday which really frustrated me was have a different point of view, but what really concerned me what how come I wasn’t invited to speak at the march? Restrictions on high-capacity magazines [won’t solve the issue]? That won’t solve the issue. Enforcing the regulation that’s currently in law, the cowards of Broward failed. The FBI failed. Sheriff Scott Israel failed. So many different...levels failed in Parkland. And it’s reprehensible that I didn’t see one poster at the march that said...F Sheriff Scott Israel. That government failed is a reasonable starting point for debate on which all sides agree.